Bruxism is excessive clenching and grinding of the teeth that is not part of normal chewing movements. It can lead to increased wear or damage to the teeth and cause permanent damage to the jaw joints. Bruxism may be particularly damaging when it occurs during sleep as you have no conscious control over the forces and movements. Possible causes of bruxism could be physical or psychological stress, sleep disorders and abnormalities in your occlusion (bite) from teeth or fillings. Signs and symptoms include; stiffness and pain in the jaw joint or surrounding muscles, pain or sensitivity in the teeth, chronic facial pain and headaches, the noise (commonly noticed by family) as the teeth are ground together, worn tooth surfaces and broken or chipped teeth. For the treatment of bruxism your dentist may recommend counselling, stress management or relaxation methods to reduce the level of stress you are experiencing. Consultation and treatment by a physiotherapist may be advised. You may be prescribed painkillers for the muscular and joint pain; or a muscle relaxant to help reduce tension in the jaw muscles. Treatment for mild to severe grinding behaviour may involve an occlusal splint. Worn mostly at night the splint can be made from hard or soft plastic and cover the upper or lower teeth. 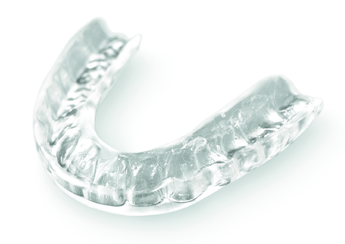 The splint separates the upper and lower arches to prevent further wear and damage to the tooth surfaces. Teeth already damaged from bruxism may require repair with dental fillings or crowns. Root canal treatment is an option where tooth fractures extend into the nerve, but in extreme cases extraction of badly damaged teeth could be the only option.